As Bali continues to reveal itself, layer by layer, like a large red onion, this year I learned so much more about the Bhuta Yajna Rituals which are performed on the day before Nyepi (the Balinese new Year). 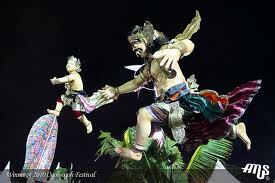 Legend has it that on this day, Yama, the lord of evil, opens his gates and all evil deities descend upon the island. Much preparation and ceremony is undertaken to dilute this sudden onslaught of demonic presence. 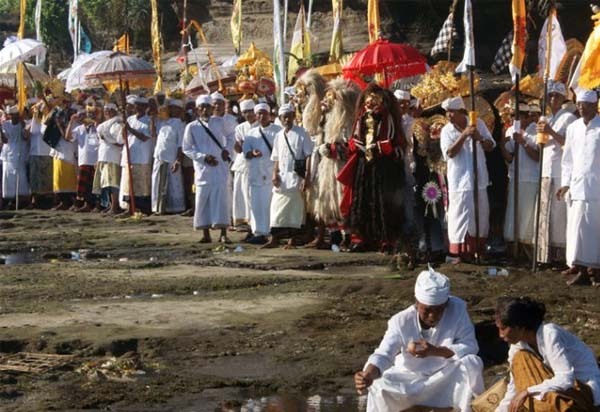 Some say the ceremonies are meant to scare away the evil deities, while others claim the proceedings will awaken them so they can be placated with offerings. Whatever the reason, the result is a fantastical display of teamwork involving monsters, gongs, cymbals, and fireworks. 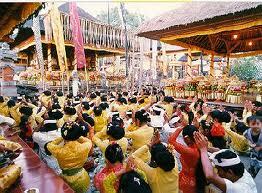 Traditionally this was a Cleansing Ritual, evil spirits being summonsed through prayer, noise and smoke. In the 1980’s the young people in the Banjar’s pushed for and were given permission to express themselves through the creation of large papier-mache statues that they parade around the street and partake in mock battles, much like a large chaotic rugby game. Members of each banjar spend weeks designing and creating what they perceive to be the “evil du jour.” Past years have seen effigies of George Bush and Amrozi, the Bali Bomber. Last years favorite theme was giant ex-pat men, complete with beer and ladies of the evening. The rabies breakout inspired the creation of dogs nipping at the heels of these Western monsters. These are, of course, the more contemporary creations, but most are still the traditional demons of Rangda, and other mythological creatures. This year we found ourselves initially at the football field in the centre of Ubud where thousands of foreigners outnumbered the participants by at least 10 to one, so we decided to head off to Bedulu some 10km away where proceedings are more traditional. And sure enough the range of creativity displayed was as spectacular as ever ranging from a large Ganesh-like elephant figure riding an extremely angry looking Rat God, through to a highly unflattering witch-like “Bule” (foreign) woman in short revealing skirt (yes all the details were included !). Large groups of young men dressed in sarongs and t-shirts guard their creations with sullen faces and anticipatory glances, as on this night the evil spirits will inhabit the body of the ogoh ogoh. 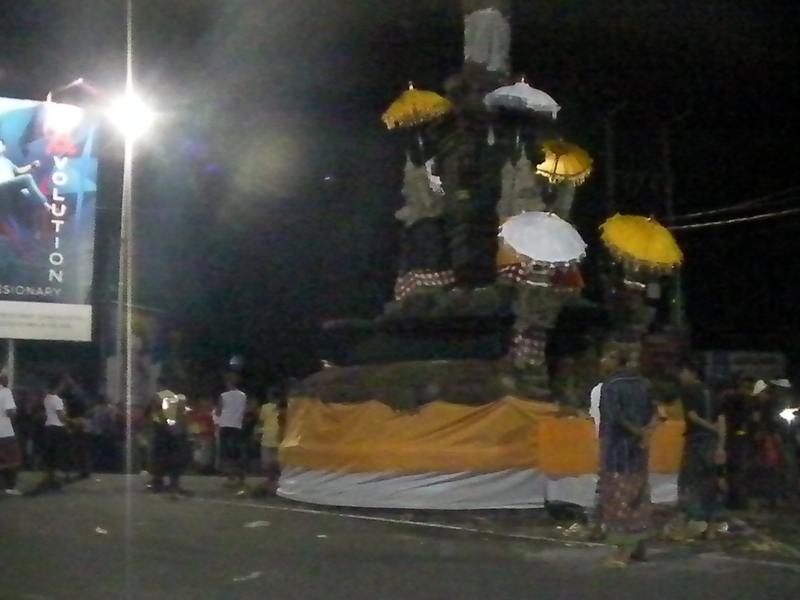 As the procession begins, the banjar teams raise their effigies high into the sky, and perform a fighting dance that is simultaneously graceful and insidious. The monsters appear to come to life as they spin and glide around each other. At cross streets they are spun three times counterclockwise to confuse the spirits. 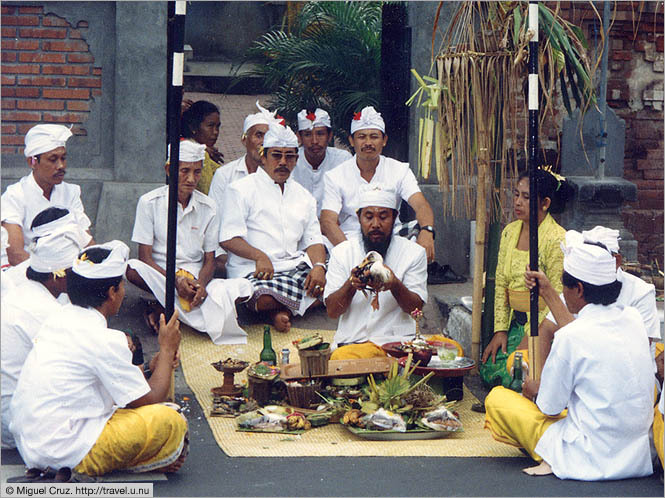 In the past, during election years, ogoh ogoh have been banned, as it is common for arak to flow freely at this event. 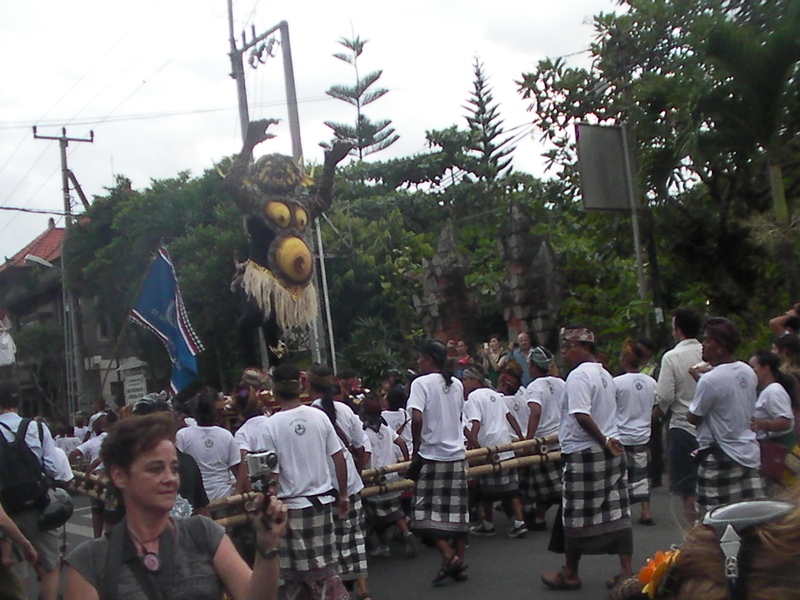 Emotions can run high during an ogoh ogoh procession, and conflicting political views have been known to ignite violent behavior. In Bedulu the atmosphere was tense but friendly. However, at the end of the night when we tried to locate the spot where the effigies are burned, and the evil is put to rest, we were politely informed that this was not something that outsiders are allowed to witness….